Will Rhodey Die in Captain America: Civil War? You can't have a superhero civil war without at least one major fatality, and things aren't looking too good for at least one Avenger. 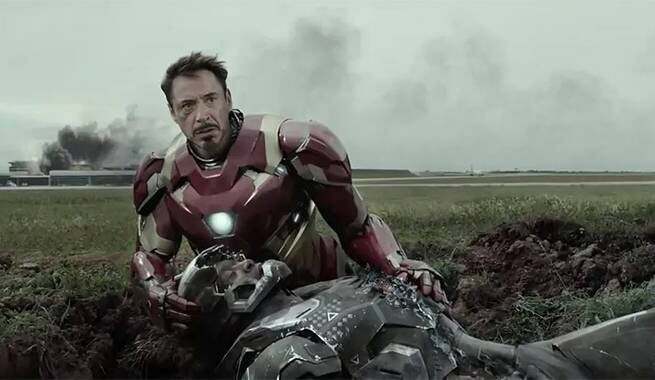 In both Captain America: Civil War trailers released so far, James "Rhodey" Rhodes has been shown in bad shape as a distraught Tony Stark looks on. And here's a closeup of Rhodey's face during the just-released second trailer, right after Tony rips the mask off Rhodey's armor. 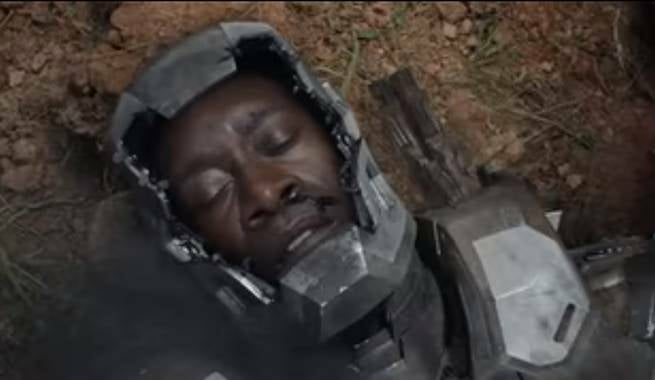 It's certainly possible that Rhodey is either unconscious (or resting his eyes), but Rhodey's death would add a very personal level to the building conflict between Captain America and Iron Man. After all, the central conflict of Civil War appears to be Iron Man trying to apprehend Captain America's best friend Bucky Barnes, so it would be a pretty cruel twist of face if the conflict led to the death of Tony Stark's best friend. While we don't know who puts Rhodey out of commission, one likely suspect is the Winter Soldier. As shown in the first trailer, War Machine's arc reactor looks like it was ripped out of his armor and the Winter Soldier is probably the only person on "Team Cap" capable and willing to pull off that feat. With a cyborg arm and a much meaner streak than his best friend Steve Rogers, it's definitely possible that the Winter Soldier is the one responsible for injuring/killing War Machine. In the comic version of Civil War, Black Goliath was the major fatality of the superhero civil war. Black Goliath, a longtime ally of Hank Pym, sided with Captain America's anti-registration forces and fought in the first major conflict between the two sides. However, Iron Man's "trump card", a cybernetic clone of Thor, murdered Black Goliath as he was growing to superhuman size. Black Goliath's death marked a turning point in the comics Civil War, and Rhodey's death would certainly also turn a superhero squabble into a full-blown conflict. We'll have to wait a few more months to learn about Rhodey's fate. Captain America: Civil War hits theatres May 6th, 2016.